How “god” evolved #3: How does “god” promote co-operation? Belief in a “high” god who created humanity and gave us a moral code to live by is very common in most Western societies. Indeed, for the past thousand years or so such “high” gods have been one of the defining traits of Western culture, driving architecture, art and music. However, despite this importance we still know very little about how they developed. Luckily new research has helped shed light on the subject, revealing that belief in a “high” god is fostered in complex societies where it promotes the co-operation needed for them to survive. Earlier work supports this idea, showing that there was a “religious revolution” of sorts in the Near East as groups became more socially complex. Clearly more research is needed to work out why belief in a “high” god fosters co-operation. Luckily for us we’re dealing with scientists, to whom a gap in our knowledge is an exciting challenge and consequently a study has indeed attempted to answer these questions. The research in question consisted of getting subjects to play the dictator game in which they had to decide how many coins they would take from a fund and how many they would leave for an anonymous stranger to have. This game is a staple of the anthropological literature with numerous studies using it to study the extent to which people co-operate. In this case the procedure was modified slightly and half the study underwent a religious “prime” (the other half being a control group to see if the results didn’t require the priming). This prime consisted of getting the subjects to create a sentence from a set of words, including various religious words like “spirit” or “divine“. 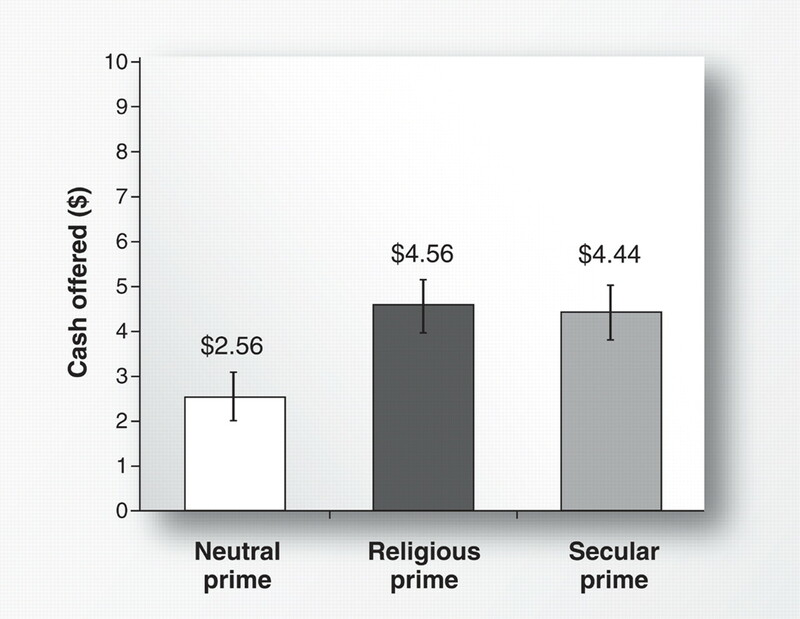 The results showed that those who underwent the religious priming left $4.2 on average for the anonymous person in stark contrast to the control group, who only left $1.8. The control group results are similar to other studies using the dictator game which found that nobody will leave more than $5 dollars for an anonymous other, with most leaving nothing. Meanwhile the most common amount left by the religiously primed was $5, with some even leaving $10! This effect is made all the more interesting by the fact that religious belief seems to have no influence on the result with atheists also being more generous if they were primed and theists being stingy if they were unprimed. However, this research was not without its flaws. Notably it had a sample size of only 50 and all were students from the University of Vancouver (since when did Canadians count as people anyway?). So the researchers conducted an improved study drawing upon a larger sample from the entire population of the city. They also changed their method slightly, dividing their cohort into 3 rather than 2. The first group received religious priming like before, the second no priming and the final group received secular priming. These had to unscramble sentences containing secular words related to morality like “justice” or “law“. Despite increasing the size of their study they still got the same results as before. Religiously primed people left more money for the anonymous person whilst the control group left a typical amount. However, they did also discover that those who had received the secular priming also donated more money to the anonymous individual, about on par with the religious group. Again, pre-existing belief had no real impact on these results and to double check they also interviewed participants after the study. Surprisingly they found that participants were not aware of the “priming”, not having been consciously reminded of religion by the priming activity. The results from the second Canadian study, to prove I’m not lying! Although this second study did include a more diverse range of people (i.e. those other than students) it’s still limited because it only included Canadians. Do these results hold true for people from other countries? A masters thesis seems to indicate they might well do, having carried out similar tests on Fiji islanders and getting similar results. The notable exception being that case the secular “primer” (in this case being reminded of the police) had little to no effect on this behaviour, although this could be explained by the fact that the nearest police station is a few islands over and only opened in 2011 so has had little impact on their daily lives. This lack of sufficient secular priming is one of the two main problems with this study, the other being that these islanders are not completely distinct from the Canadian culture of the previous studies. Although they still hold to traditional beliefs regarding ancestor spirits, witchcraft and devils they have also been converted to Christianity. Despite seeming to be at odds with each other these traditional beliefs are held side by side with the Christian God (whom they call the “God of the book”). This dualism is fascinating in its own right but alas it is a story for a different blog. However this problem doesn’t defeat the premise that a “high” god promotes generosity to others since the Canadian research also identified the effects in non-Christians and the islanders’ beliefs seems fairly different from the Christianity we all know and love. So it would seem that these studies are valid and provide an explanation as to why a “high” god is linked to co-operation: it increases generosity. This would be particularly useful in a more complex society where not everyone may be in your “in-group”. There could be another social class or the culture could simply be so large you don’t know/aren’t related everyone (which may be why smaller cultures do not need such a co-operation boosting belief. Family relationships between individuals may be sufficient). It may also go some way to explaining why not every complex culture has a “high” god since it shows secular institutions can be just as beneficial to co-operation. Of course, such a belief may provide other benefits to co-operation but at least we’ve managed to slot one piece of the puzzle in place. A “high” god makes people more generous which in turn is a boon to co-operation, particularly in complex societies where the typical motivations for generosity are no longer applicable. McNamara, A. 2012. “WHEN DOES IT MATTER THAT GOD IS WATCHING? : DIFFERENTIAL EFFECTS OF LARGE AND SMALL GODS ON CHEATING AS A FUNCTION OF MATERIAL INSECURITY IN YASAWA, FIJI.” Masters thesis, University of British Columbia. I’m loathe to return to this topic because it typically garners thousands of views. Whilst the ego boost from this popularity is nice, at the same time it’s kinda depressing how I pour all this effort into other topics and get nothing, yet press a few controversial “hot-topic” buttons and thousands come pouring in. Still, the research is interesting and the ego ravenous, so here you go! We might suppose, then, that that generosity is likely to be increased even more when co-operation is further engendered by threats of eternal damnation and torment in the afterlife to the un-co-operative. Fascinating. The only study which really examined punishment was the Fiji one, but the poor secular alternative makes it difficult to compare them and work out if it was a real factor. I think the key point is that it’s motivating you to co-operate with individuals who lack the family/cultural ties which would ordinarily be what drives you to help someone. Yet just because they lack such ties does not mean the interaction cannot be fruitful for both parties so ultimately the individual who is more inclined to give the other person a chance will probably come out on top. Imagine, for example, if these results were the first round of an iterated dictator game rather than a single shot version. Wouldn’t those who’d been given religious priming and donated more be more likely to receive a better donation in later rounds? Sure, if people were being rational about the situation but they often aren’t. Religion – along with reason and secular institutions – is simply one possible path to circumvent the selfishness which isn’t always beneficial. The fact that such alternate routes exists is probably why no single one is used by everyone. 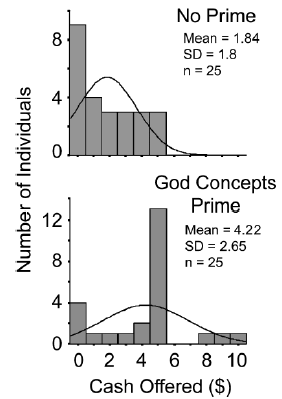 Only ~40% of complex societies, for example, have a “high” god because there are other ways to get around the problem. Is using your reasoning to justify your reasoning viciously circular? If not, why? Are you telling me you did not employ your reasoning in order to study, form and articulate your thoughts? I try to use reason as much as possible and justify its application with the fact it has consistently shown to be the best method for figuring out what is untrue, unwise and unnecassary. But you use your reasoning to justify your reasoning. Is that viciously circular? I justify it’s application with a fact. But you are using your reasoning to interpret the “fact” as true. Therefore, you cannot escape that you use your reasoning to justify the validity of your reasoning, the same way you use your senses to justify the validity of your senses. Therefore, is that viciously circular? What reasoning and interpretation is required to make the simple observation that reason works? but since you denied that you yourself were using reason, I was simply pointing out that you were. Oh, I thought it was specific to that sentence and have spent a good deal of time trying to work out why scientists liking mystery was circular. Look again at your graph and consider one other factor common to organized religion: priests! The significant difference was the presence of primes. A class of priests and more if you add in a culture of weekly services – you get an endless sequence of primes that could dramatically channel behavior towards whatever goals the state or temple settled on. It certainly would be interesting to see if people could be trained to take other actions via similar primes. But then again, they might simply be amplifying an existing innate “altruistic” behaviour and so could not be re-programmed to generate other behaviour. I can’t see how you could test this however, since it would likely involve raising a child in a specific set of circumstances (or perhaps retraining adults) which would (a) take a lot of time and effort and (b) probably be unethical. Adam, if you drop the requirement of ‘altruistic’, humans have a very wide suit of behaviors to tap into. Expand your vision of ‘prime’ to include anything ‘motivational’ and include in your data set all of history (pre-history would be rather more problematic to evaluate) and you can leave the unethical choices to others (there is no shortage of those in history): Gandhi ‘motivated’ Brittan to pack its bags using their own mythology of proper behavior. You know without further research what sort of behaviors Mao, Pol-Pot and Hitler encouraged from their followers. Not to forget Jim Jones. I think it safe to accept that we know much of what is possible without new research. I do believe all of those behaviors ‘innate’. As humans are evolved for diversity, we don’t have to invent ‘new’ behaviors, just encourage the beneficial ones. To expand on your thought experiment, raising a child would fall under ‘socialization’ more than motivational primes, and I think we are very actively (as a society) working on that in our public schools, improving teacher education and training parents on child rearing. I suggest that the better we execute childhood socialization, the less we rely on primes from priests to achieve appropriate social behavior. Additionally, the better we can get persons a, b and c to behave, the more likely it will be for person d to follow suit. If you accept that people have some innate sense for how well they and their community is performing, you could postulate that once a society achieves a certain threshold of good behavior, they would begin moving away from religion as they could feel that they no longer needed the ‘help’ of priestly reminders to behave themselves. That is so long as they felt the occasional urge to hit someone, they would seek ‘self-help’ from a Sunday reminder to calm down. Once consistently calm (or adequately taught self-control from childhood), those reminders would no longer feel helpful. Such individuals would use that time for something else – just making sensible resource allocation decisions. I’d love to hear your thoughts on cooperation in affluent relative to less developed societies – e.g. i know some studies relate a decrease in empathy with affluence, or at status – and how/whether that might be related to the decline in religiosity. I have no thoughts on the matter since I don’t really study stuff that recent. Whilst it does sound interesting and I would certainly like to learn more about it at the end of the day my opinion is no better than a lay-persons. So, I think about evolution of cooperation a bunch, and the method coopted here are image scoring and/or 3rd party punishment. In other words, the usual explanations are that you think God is watching you (maybe subconsciously, like in the eye versus flowers for tea tip jar) and thus will be judge you (image scoring, reputation effects) and/or punish you (3rd party punishment). These are pretty robust ways to get cooperation, but they are also pretty complicated. In particular, in my opinion they are much more complicated than say tag-based cooperation (i.e. ethnocentrism) which you mention in passing as “Hey, I saw you in church, let’s be friends!”. However, even ethnocentrism isn’t very robust under cognitive cost. All of these can be part of an explanation (nothing ever has a simple story, so they all probably play some part), but they are not very satisfying to me because it is sort of like pulling out the heavy artillery right away. I prefer more ‘minimalistic’ explanations. For this, I like Hoffman’s interface theory, the basic idea is that we shouldn’t assume that the representations that best reflect reality are the fittest ones. Instead, the most convenient representations are the fittest. We can combine this idea with indirect fitness effects from things like spatial structure (not the more typical indirect fitness from relatives) to get the evolution of useful delusions to promote cooperation. This appeals to me much more, because then we can bring in the cooperation + religion argument much earlier, say back before punishing/judging gods as you describe in your recent post. We can start to describe some of these early misrepresentations of reality as ways to promote cooperation and then build later versions (such as ethnocentrism, image scoring, punishment) on top of them to further refine and tighten cooperation, or let it generalize to less structured environments as tribes grow larger. In my mind, although probably not in this rambling comment, it seems more coherent to me.